Direct Relief, a humanitarian organization that delivers medical supplies to crisis areas, uses Esri mapping technology and data to send resources to Houston during Hurricane Harvey. Direct Relief was formed after Hurricane Katrina to get medical supplies to the most vulnerable populations in disaster areas. The former head of FEMA, Michael Brown, said that Harvey’s devastation will be worse than Katrina, which tore through Louisiana in 2005. Direct Relief uses data layers from the Census, the National Weather Service, and other open data platforms to target where certain medical supplies such as inhalers and other medications will be needed. Clinics can send requests for supplies to Direct Relief using its online portal or through a direct phone call or text message. Andrew Schroeder, director of research and analysis at Direct Relief, said that a lot of facilities in Houston had Internet access as of Aug. 28, which would allow them to send requests for supplies online. To prepare for Hurricane Harvey, Direct Relief sent supplies to medical centers and clinics across the Gulf Coast, shipping enough material to last for about six days. Direct Relief plans to send more as supplies run out. Last week, Schroeder began monitoring the storm and preparing the necessary data layers, including where the storm was likely to hit, where Direct Relief’s partners are located, and the needs of the patient population. “Areas that have say a disproportionate amount of elderly people are likely to have movement impairment issues,” Schroeder said. Schroeder prepared maps, using Esri geographic information system (GIS) technology to identify the most vulnerable populations in Houston as the storm hits. Schroeder found that the homes around the Buffalo Bayou will be some of the most affected. It could take more than two months for these residents to recover from the storm. 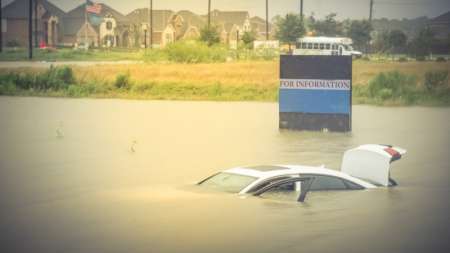 “Even though the whole city is obviously deluged there are areas that will be disproportionately affected and will take a long time to recover,” Schroeder said. Schroeder also found that residents in the northeastern section of Houston experience a much higher social vulnerability to disasters than residents in the southern section of the city. Schroeder said he uses Esri because it is a readily available tool that already has the applications he needs integrated into the platform, which is an asset during rapidly approaching and changing storms. The application also allows Schroeder to easily share data with partners and residents in Houston. Esri has created maps and applications to help with the flood response, including the Houston Live Information Map, which tracks flooding, road closures, and rain forecast. This data helps first responders and city officials to make potentially lifesaving decisions. More than 20 local government departments have requested help from Esri throughout the timeline of the storm, through the Esri Disaster Response Program, which provides software, data, and technical support for active disasters regardless of whether the user is an Esri customer. The Federal Communications Commission and the Department of Homeland Security activated the Disaster Information Reporting System (DIRS), a voluntary, Web-based system that communications providers can use to report communications infrastructure status and situational awareness information during times of crisis. Schroeder said that the flooding and destruction will have lasting effects on the Houston population. “One of the key things is going to be paying attention to the consequences of the events for years to come,” Schroeder said.